Every day millions of people start their day with eggs. The most common egg in use is the chicken egg. You may also find: duck eggs, turkey eggs, turtle eggs or eggs from anything else that lays its eggs in a shell. The old breakfast favorites roe and caviar are eggs without a shell. Eggs got a bad rap for a long time. They were supposed to be nearly lethal if consumed in quantities of more than one per week. The latest news out is that they are not all that bad for you. I eat a lot of eggs, and I'll put my cholesterol level up against any one hundred and twenty-five pound vegetarian's any time. We are going to take a look at eggs this month and perhaps solve some of the mysteries surrounding the tasty ova. Most folk buy their eggs at the supermarket in the nice plastic cartons. It's always a good idea to open the carton, being careful not to drop any eggs on the floor, and check the eggs for cracks or worse. Eggs come in a lot of sizes. The most common are medium (21 ounces of eggs per carton), large (24 ounces in the carton), and extra large will give you 27 ounces of eggs. You will also find small and jumbo eggs. The smalls are smaller than the medium and the jumbos are larger than the extra large. Eggs are also sorted according to quality, AA being the best grade, followed by A and B. Always look for the AA. Scientific studies show that the only difference between brown and white eggs is the color. Amen. The majority of our eggs come from caged hens that spend their entire lives in a huge building with thousands of their sisters just eating and laying eggs. The free-range egg comes from a hen that is allowed to play outside and consume things other than the chemical and antibiotic-laced packaged food of the caged hen. On any given day the free-range egg will have a deeper color to the yolk. This comes from the varied diet, especially having green things to eat. There is no contest between the cage egg and the free-range egg when it comes to nutrition. The free-range egg will have more Vitamin E, beta-carotene, Omega 3 fatty acids and less cholesterol. Some of the free-range eggs you get will have a tiny spot of blood in them. This means the hen and a rooster have been intimate. The blood spot is harmless, just unattractive. You can remove it. In any egg supply you will find an occasional egg with a double yolk. That is one that contains two yolks in one shell. These will almost always be larger than the regular egg. The double yolk seems to be a genetic trait passed from hen to hen. It's a freak of nature, like twins in humans. They are perfectly good to eat and are a bargain in the end. The egg cartons should have a use-by date on them, but I don't trust that very much. Best deal is to buy your eggs where they sell a lot of them. This results in new, fresh stock being added all the time. When you get the eggs home, the way to check freshness is to crack one into a lightly greased skillet. If it's fresh, the yolk will stand up and remain nearly round, the white will gather around the yolk and not spread very far. If the yolk goes flat and the white covers the bottom of the pan, it's not real fresh. Unless you are Rocky Balboa training for a fight, you will probably want your eggs cooked. It's a good idea in any case. Raw eggs can contain bugs that are not all that healthy. The first thing that makes a successful egg chef is the knowledge that an egg fresh from the icebox is hard to cook. You should set the eggs you plan to use the next day out on the counter overnight and let them come to room temperature. This won't hurt a thing and will make cooking easier. Eggs got a lot of their bad rap because they were fried the old-fashioned way in a skillet with lots of grease. The egg was dropped in the hot grease and then the grease was either splashed or spooned over the top until it was as done as desired. The best way to fry and egg is to use a non-stick pan or a well-seasoned cast iron skillet. You fry the egg in just a touch of butter, say a quarter or half teaspoon full. For sunny side up, you just let it simmer until it's as done as you want it. 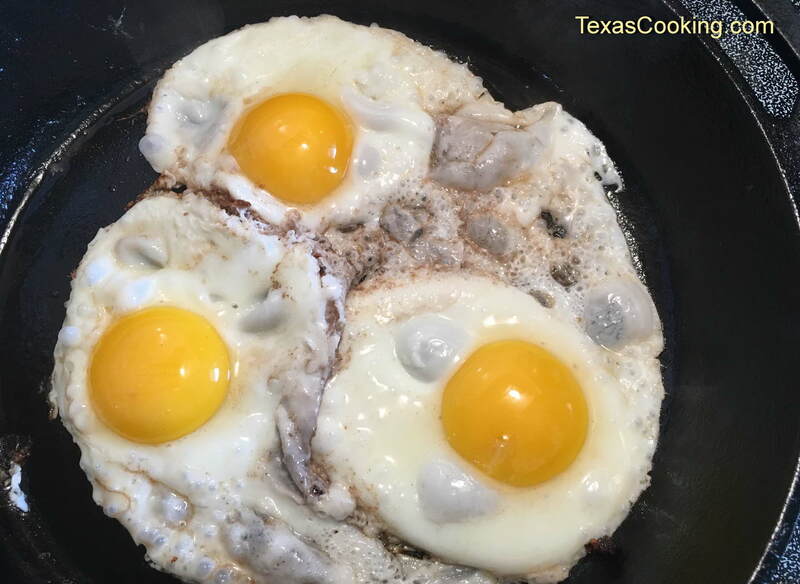 For the Texas style "over easy", as soon as the egg has set enough, you flip it over and cook the other side leaving the yolk just a tad soft in the middle. [Note: Lawry's Seasoned Salt does wonders for fried eggs]. This is the one place where the freshest eggs are not the best. Real fresh eggs are near impossible to peel after being boiled. Eggs that are a week or two old would be best. The accepted method for boiling eggs now is to start them in cool water with a teaspoon of vinegar added. This is supposed to strengthen the shell. Bring the water to a full rolling boil. Cover the pot, and set it off the heat for ten to fifteen minutes according to how well you want your egg done. Then you run cool water on the egg(s) until they are cool. If you peel them under running water, it works a lot better. Sometimes the egg will cook too long and a green coating will form around the yolk. This is harmless, just unattractive. There are three dishes you cannot make without boiled egg, tuna salad, macaroni salad and egg salad. To make scrambled eggs, you break two or more eggs into a mixing bowl and beat them well with a whisk or spoon. I put about a teaspoon of water in for two eggs. Some folk add a little milk or cream. Try it and see which you like best. I think the water turns to steam and makes the eggs a tad fluffier. You season your eggs with salt and pepper. Turn the eggs into a lightly buttered skillet and keep mixing them around until they are as "set" as you like. Remember, they will continue to cook for a while after you take them out of the pan, so adjust your cooking accordingly. Omelets are made from scrambled eggs that are not stirred around while cooking. The eggs are allowed to set like a pancake. Various things can be added into the uncooked eggs, but the majority of omelets are folded over precooked ingredients. This subject is way too long to go into in depth now. Poached eggs are cooked out of the shell in hot water. You bring a pot of water to a simmer. Add a tablespoon of vinegar, which will help hold the egg together. Gently crack the egg and drop it in the simmering water as gently as possible. After four minutes or so, remove the egg from the water with a slotted spoon. Carefully place it on paper towel to drain. Season and consume. You do not want the cooking water at a rolling boil; it will tear the egg apart. To coddle an egg is to cook it in hot water in a container. The little egg poachers you see for multiple eggs are actually coddlers. To shirr an egg is to bake it in a container with a topping of cream and buttered breadcrumbs. There you have the short version of things you can do with an egg. Next month we will have some egg recipes. In the meantime, if you check the breakfast menu over on Grandma's Cookbook, you can find enough egg recipes to keep you occupied and happy until I get back.